I'll be out of the house on business all day today but wanted to share a little something I made with you. This card is for the sketch & color challenge on the Stampin' Addicts site....we had to use Bashful Blue, Riding Hood Red, Pacific Point, Tangerine Tango & So Saffron. I didn't think I could pull this off at first but when I looked @ the final result....I think it came out pretty good! If you decide to join the above site, tell them Jackie sent you!!! I hope everyone has a great day and I'll be back hopefully tomorrow with my Mojo card! Thanks so much for stopping by!!! I really love how you added the ribbon on this one. this is a beautiful card..and givescme ideas for a great color combo..love these colors together..TS! I really like this card! The colors you had to use would really throw me, but you pulled them together so well! I've been busy and haven't commented on your cards this week, they are all lovely. I can't wait to get that rose embossing folder, it's on my order list. Makes such beautiful cards. lovely flower stamp and lovely sentiment. Lovely colours too! Wow! Love your card and I really love the way you did the bow. You did a great job with this challenge. 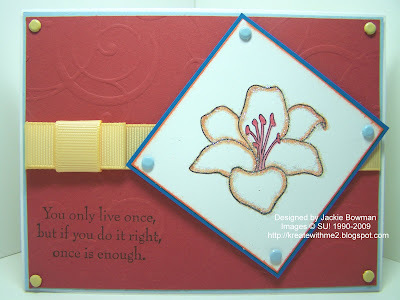 turned out very very nice Jackie, and I love the embossed background and the stamped image!!!!! Pretty work, Jackie!! Your card looks sensational!! The tailored way you've attached the grosgrain ribbon here is a nice change from the usual knot. Works really well on this design. This is a lovely image, something that could be used for all sorts of cards, love it! Jackie, what an awsome card love how you did the ribbon! Great card! I love the embossed background. Great card as usually Jackie. I love how you did the ribbon on this one! You know I am going to have to try that! That is a very hard color combo to work with! You did a great job Jackie!! I love the embossing! Liking these card where you used the big shot. Everytime I blink there's a new machine out. do you have any others ? So pretty, Jackie! Love how you tied the bow! Had to come by here and see what you were doing ? :). This is a lovely Monday card, love how you put the colors together on this, Have a great day. Beautiful card as always Jackie! Great color combo! I wouldn't have thought to put those colors together. Love your flower and that sentiment. Very nice, Jackie! I like this LO and the way you tied your ribbon. Very cool color combo. I like your ribbon detail. Beautiful. I love the embossing. Very pretty...great color combo...I think RHR is my all time favorite SU color...I'm stocking up, lol!! Love how you did your ribbon too...very different! super cute Jackie!!! Love it! Love the colors. Very nice card. Hi Jackie! I have given you an award for your blog. I really enjoy seeing all of your creations and reading your entries on your day and your family! Wow, You've been busy. These are gor--JUS. Way to go getting all those colors together to create this beauty....love the stamps and wonderful layout!!! This is so pretty. Love the way you did the colors and design! Beautiful! You pulled all of the colors together beautifully. I love it. You did a beautiful job with these colors! I tried and failed-I finally decided just to wait for the next color challenge or do the week before.